Here is a janky screenshot from Quotidian Press’s Instagram, where upon my absurd “4 L.L. Bean tote bags on the bus” method of taking my stock down to Publication Fair was captured for all to see and OUR VERY OWN INSTAGRAM was tagged. Follow us there! Our annual favorite fair in town happened again and was lovely! We sold our newest titles (and a healthy dose of Preschool Plays) the local pal-crowd. Hello (024) by Carol Ellis, The Last Time My Sadness Was Convenient (025) by Delphine Bedient, and Everyday Mythologies (026) by Joshua James Amberson are now in the bookshop. We also finally have the 3rd edition of “The Collected Plays 2010-2015 by Portland Preschoolers” in stock! I recently helped my good friend Adam Monkaba design and print this fancy business card. Shown here to say “if you want some Two Plum Press letterpress advising, this is possible.” You should visit Adam’s website. It is very beautiful– he makes furniture and takes photos and writes and makes books. Also, on the business card thread… we finally have business cards! Ever asked us “hey, do you have a card?” and then watched us hang our heads in shame? No more! We hosted our largest reading yet at the Independent Publishing Resource Center on November 30th. This reading was a release celebration of several new titles: The Three EPs and All In Black Blood My Love Went Riding by Ross Robbins, Hello by Carol Ellis, The Last Time My Sadness Was Convenient by Delphine Bedient, and Everyday Mythologies by Joshua James Amberson. All of the above authors read, along with Chris Maday, Michelle Overby, and Izzy Ferguson. This reading featured a fun new concept for transitioning from reader to reader. After each set, the writer who finished reading would draw a piece out of a cookie tin Alex was holding, read the piece and announce the author. That author would then get up and do their set. It was such fun. Some images of the reading night. Onion spelt scones, a sea of books, and a sea of people. Later that weekend, Alex and Andrew and Joshua drove up to Seattle for the Vera’s Project’s DIY Holiday Fair. Since ShortRun was a no go this year, this afforded the Seattle-crowd a chance to snag new Two Plum titles! We also got to buy a cassette tape shaped cat toy from Rose Melberg, and that was worth the trip in and of itself. Andrew went to London this year and hung out with his friend and favorite contemporary book designer, Coralie Bickford-Smith. 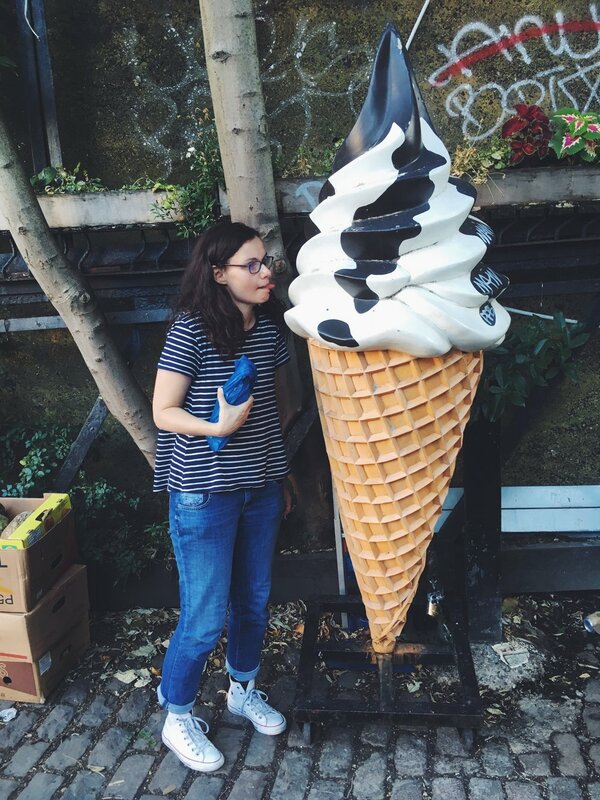 Here is a picture of Coralie with some ice cream and a book store sign down the alleyway from a very good Kurdish restaurant.